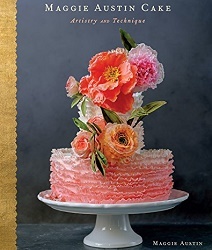 As readers of Cake Geek will know, we’re huge fans of Erin Gardner and The Wild Orchid Baking Company so we were super excited when a copy of Erin’s new book arrived on our desk. Our biggest problem was trying to choose which of the 30 cakes to share with you – there were lots of new techniques and brilliant tips but we eventually settled on Erin’s hand-stamped floral “Craft Cake” above. Stamped cake designs and illustrated sugar plaques are two techniques we haven’t tried before so we were eager to learn more. Over to Erin….. 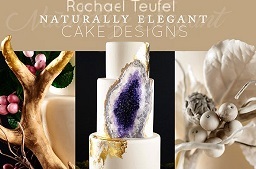 Sometimes a client will ask me to explain a specific kind of cake skill or technique. Then almost immediately they’ll say, “Never mind! 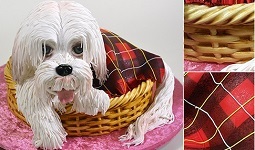 I’m not an artist, and I could never do that.” Well, you don’t need to be an artist to decorate a cake. 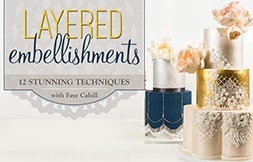 Templates, molds, and stamps provide foolproof ways to create new patterns and designs that are specific to your special event. Use a similar (but not the same) stamp to create invitations or other paper good details. 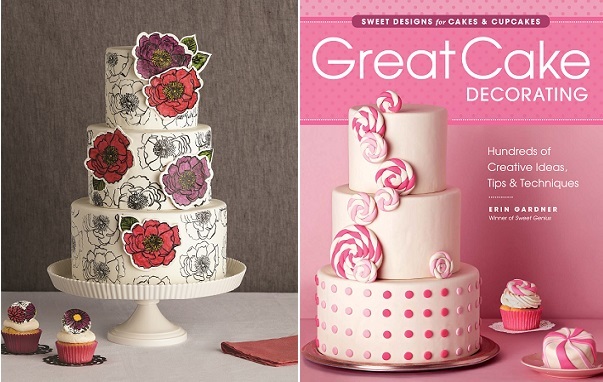 If you want the pattern on your cake to match exactly, then I recommend purchasing two of the same stamp and keeping one in the kitchen and the other in the craft room. 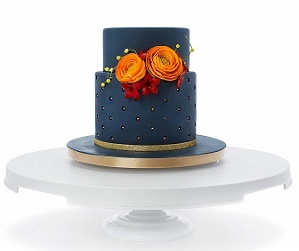 Note: The stamped flower appliqués can be made ahead to save time when assembling the cake. Store them in an airtight container in a dark, dry place. Stamped designs are sensitive to heat and humidity. 1. 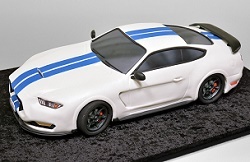 Roll out the gum paste to about 1⁄8 inch thick. 2. Pour a quarter-sized dollop of black gel food color into a small bowl. Dip a foam craft brush into it, gently wiping away any excess onto the lip of the bowl. Apply the gel food color to the stamp. Press the stamp gently and evenly onto the gum paste. 3. Repeat the stamping process to create four more black flower appliqués, reapplying the color to the stamp each time. If the stamp starts to accumulate food coloring, rinse it under warm water and dry it thoroughly before starting to stamp again. 4. 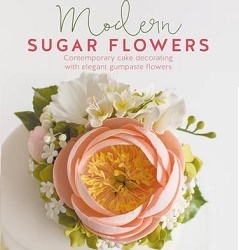 Next, use a sharp knife or scalpel to cut around the stamped flowers, about 1⁄4 inch from the outer line of the flower. 5. Move the stamped appliqués to a parchment-paper-lined cookie sheet, and allow them to dry thoroughly overnight. 6. Repeat the same technique using the leaf stamps to create five leaf appliqués of each size. 1. 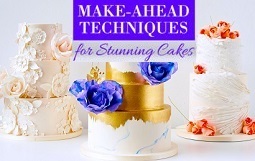 Cover the cakes in white fondant and dowel each of the cakes, but do not stack them yet. 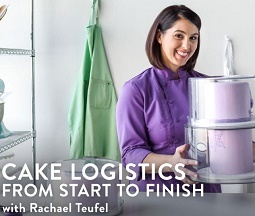 Leaving the cakes unstacked will make them easier to stamp. 2. Stamp the cake using the same coloring and stamping process as for the appliqués. Start with the bottom tier and press the stamp onto the surface of the cake while applying gentle, steady pressure. Press firmly enough so that the stamp is even, but not so hard that the lines become blurred. Practice on the back of the cake or the cake top center, which will be covered by the other cakes when stacked. 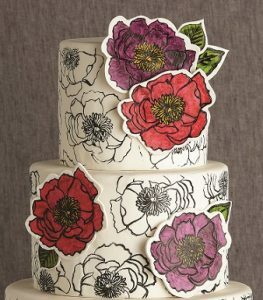 3.When you have had enough practice, stamp the sides of the 10-inch cake with the flower stamp. Apply color to the stamp each time you use it. After creating the desired pattern on the cake, set the bottom tier aside. 4. Place an 8-inch round cake pan upside down in the center of the turntable and put the 8-inch round cake on top of that. Elevating the cake will give the clearance needed to bring the stamped design all the way down to the edges of the cake. 5. Repeat the stamping process. Set the cake aside to allow the gel color to dry. 6. 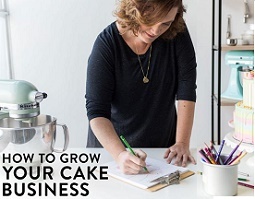 Turn the 6-inch cake pan upside down on the turntable and put the 6-inch cake on top of that. Repeat the stamping process. 7. 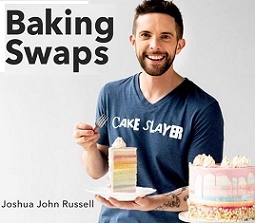 Once the stamped pattern is dry, stack the cakes. 8. Use a fine-tipped paintbrush and black gel food color to fill in any broken lines or areas where the stamp may not have come all the way through. You could also use a black food-color marker for this. Set the cake aside until the gel color completely dries, 10 to 15 minutes. 9. To paint the stamped appliqués, pour a quarter-sized amount of each gel color into its own bowl. Use your smallest paintbrush to fill in the yellow centers of the flowers. Even though the black gel color is dry, avoid going over the black lines as much as possible so you don’t smear the stamp. Paint the flower petals pink and purple, and paint the leaves green. Let the color dry for 10 to 15 minutes. 10. 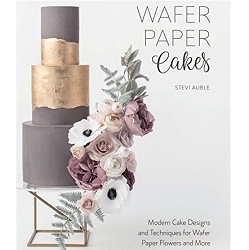 To apply the leaf and flower appliqués to the cake, spread a small amount of buttercream on the back of the appliqué using a small metal spatula. Place it on the front of the cake. I like to put two together on the top tier, with two more equally spaced apart on the second tier, and one on the bottom tier under the top tier of roses. You can place them wherever you feel they work in your design. Note: This cake holds up best when assembled the day it’s served. It should be kept in an air-conditioned room, since the design is sensitive to humidity and heat. To create hand-stamped toppers for cupcakes, use the same appliqué process as described in this design but use a smaller flower stamp. 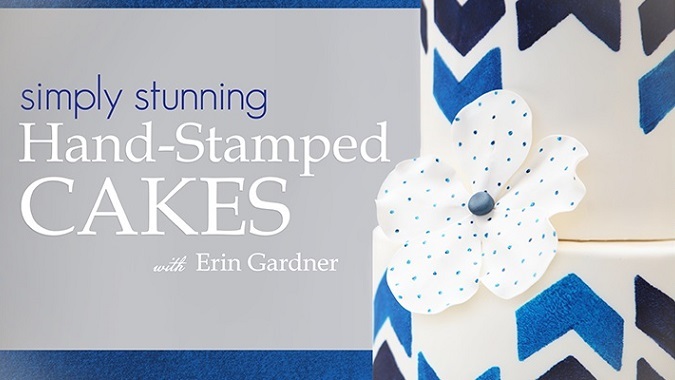 If a larger stamp is all you have, create the stamped pattern on a piece of white fondant. Paint in some areas with color and leave others black and white. Use a 3-inch round cutter and cut out areas of the stamped pattern to use as cupcake toppers. 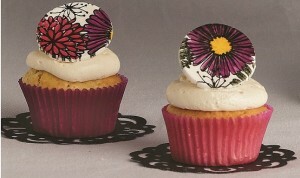 Bake your cupcakes in black wrappers (to match the black outlines) or use complementary colored wrappers. Frost the cupcakes with white buttercream to complete the look. When adding color, try not to paint over the black lines. Moisture from the gel food color can sometimes cause the lines to smudge. Try not to load the brush with too much paint; it’s easier to add more paint than to take it away. Start in the center of the area being painted and brush out toward the black outline. 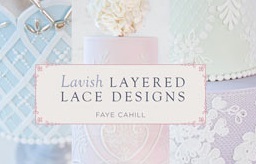 Taken from Great Cake Decorating by Erin Gardner published by The Taunton Press, with photography by Mark Davidson. You’ll find another example of Erin’s beautiful hand-stamped wedding cakes in our feature on French-inspired Toile Wedding Cakes. 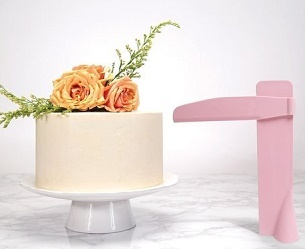 For more on cake design trends, check out the Cake Geek Magazine Facebook page for more cake style updates and the latest trends and techniques. For more on hand-stamped cake design, see Erin’s Craftsy class also, Simply Stunning: Hand-Stamped Cakes with Erin Gardner, where Erin teaches how to make your own creative stamps for everyday items such as foam, fondant, candy melts, celery, apples, marshmallows and other foods to create beautiful cakes.